During the visit, President Kovind participated in India-Chile Business Forum and interacted with young scientists at the University of Chile. Then he held detailed discussions with the Chilean President, which led to the signing of three MoUs for cooperation in the fields of mining, culture and empowerment of persons with disabilities. The agreements aim to further enhance engagement in economic, social and cultural fields between the two countries. The two leaders also released a joint statement reaffirming their commitment to enhance cooperation and ties in various key areas. Chile is the sixth largest trading partner of India in the Latin American region. The two leaders reiterated their commitment to deepen bilateral ties of friendship in accordance with the International Law and the principles and purposes consecrated in the United Nations Charter. They also agreed to enhance cooperation in the promotion of democracy, human rights and reiterated on the need to strengthen peace both at the regional and international levels, stressing that peace requires resolute fight against terrorism in all its forms and manifestations. The two leaders re-emphasised that terrorism is a global scourge that must be forcefully combated through concerted global action. The leaders called upon all UN member countries to implement the UNSC Resolution 1267. They also called upon all countries to work towards eliminating terrorist safe havens and infrastructure, disrupting terrorist networks and financing channels. They emphasised on the need for stronger international partnership in countering terrorism and extremism, including through increased sharing of information to combat terrorism, also bilaterally. The two leaders also expressed the importance of early finalization of the Comprehensive Convention on International Terrorism (CCIT). The two leaders reaffirmed their commitment to reformed multilateralism and comprehensive reforms of the UN Security Council, including its expansion in both Permanent and Non-Permanent categories of membership to make it more representative, accountable, transparent, inclusive and effective. The Chilean side reiterated its support for India`s candidature for permanent membership in a reformed and expanded UN Security Council while reaffirming its support for India’s candidacy as a non-permanent member for the term 2021 – 2022. On the other hand, India reiterated its endorsement of Chile’s candidacy to the UNSC for the term 2029 – 2030. The two leaders agreed on the importance of multilateralism to realise the 2030 agenda for sustainable development and to combat climate change, highlighting the importance of COP25 to be held in December 2019 in Chile, as an instance to give a new impetus to the agenda of climate cooperation. The two leaders highlighted the positive effects generated by the expansion of the Preferential Trade Agreement (PTA), which took place in May 2017, along with the substantial increase in bilateral trade. While acknowledging the efforts made to expand bilateral PTA, the Presidents emphasized on the need to continue working on it and exploring new opportunities for expansion of bilateral trade. Further, they underlined the importance of holding the second joint administration committee to review the implementation of the agreement and exploring new opportunities for a broader and more comprehensive agreement. The two leaders committed themselves to the vision of Indo-Pacific based on international rules-based order that respects sovereignty and territorial integrity of nations and ensures freedom of navigation and overflight as well as unimpeded lawful commerce,and that seeks peaceful resolution of dispute in accordance with universally recognised principles of international law, notably the United Nations Convention on the Law of the Sea (UNCLOS). The two Presidents agreed to open up new spaces for cooperation in health and pharmaceutical, mining and minerals, space and ICT, agriculture and solar energy, traditional medicine, social development specifically on disability issues; management of natural disasters, preferably through the exchange of experiences and good practices among the agencies responsible for these matters and education and culture cooperation. The leaders also agreed on the need to analyse and update the agreements in force in agriculture, outer space and mining to incorporate the advances in these matters and include areas of cooperation recently developed. To encourage people-to-people contact with the two nations, Chile decided to grant tourist visa exemption to Indian citizens with US visa, which will be valid for at least 6 months. The measure reflects the shared will to facilitate business, tourism, student and academic trips. The Indian side underlined that the e-Visa facility has already been extended to Chilean nationals along with long term multiple entry visas for business travelers. Besides this, the two leaders reiterated their willingness to build on opportunities to promote and expand the bonds of cooperation and understanding that characterise their bilateral relationship. Then President Ram Nath Kovind invited Chilean Sebastian Pinera to pay an official visit to India at a mutually convenient time. The two leaders reaffirmed their commitment to deepen the ties of friendship and cooperation that unite their countries, in accordance with International Law and the principles and purposes consecrated in the United Nations Charter. The two leaders stressed that terrorism in all its forms and manifestations constitutes one of the most serious threats to international peace and security. They reaffirmed that all acts of terrorism are crimes against humanity, regardless of their motivation, wherever, whenever and by whomsoever committed. They underlined the need for all states to resolutely fight terrorism. They also affirmed the need to hold perpetrators, organisers, financiers and sponsors of these reprehensible acts of terrorism accountable and bring them to justice. They also denounced cross border terrorism in forceful terms. 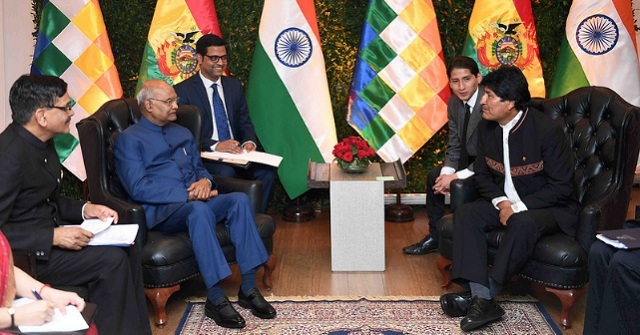 The Indian side thanked Bolivia for strongly condemning the Pulwama terror attack on February 14, 2019. Further, the two leaders called upon all the countries to strengthen cooperation to take decisive and concerted actions against globally proscribed terrorists and terrorist entities and for the early finalization of Comprehensive Convention on International Terrorism (CCIT). The leaders reaffirmed their commitment to reformed multilateralism including comprehensive reforms of the UNSC to make it more democratic, representative, accountable, effective and reflective of the new realities of the 21st Century, in order to guarantee and strengthen the multilateral system to face the new challenges and threats to international peace and security. Bolivia reiterated its support for India's candidature and India thanked Bolivia for this valuable support for India’s Non-Permanent Membership of UNSC for the term 2021-22. The two Presidents recognised the need to tap into abundant solar energy to fight climate change. India welcomed the signing by the Plurinational State of Bolivia of the Framework Agreement of International Solar Alliance (ISA). The two leaders agreed to deepen cooperation in trade and commerce, investments including commercial tie-ups, mineral resources, pharmaceuticals and healthcare including traditional systems of medicine, solar and renewable energy, ICT and space, capacity building and technical cooperation, education and culture. They also agreed to establish cooperation links in the field of geology and mineral resources, through sharing of good practices, exchange of experiences and development of joint activities. In the same context, they welcomed singing of the Memorandum of Understanding for Cooperation in Geology and Mineral Resources. The two leaders agreed to forge mutually beneficial partnership to facilitate Bolivian supplies of lithium Carbonate to India and foster joint ventures for Lithium battery and cell production plants in India. They agreed that the recent visit of a delegation from Khanij Bidesh India Limited, a joint venture of three mining public sector units, under the Union Ministry of Mines, to Lithium Mining areas and other facilities in the Salar de Uyuni in Bolivia would help create concrete collaboration in this area particularly given India’s objective to have at least 30 per cent of its vehicles run on electric batteries by 2030. The leaders also agreed to facilitate mechanisms for the commercialisation of Lithium Carbonate and Potassium Chloride produced in Bolivia by Yacimientos de Litio Bolivianos Corporacion. The Indian side proposed a follow-up visit to Bolivia by a delegation from National Mission on Transformative Mobility and Battery Storage of India for taking forward the cooperation in the area of battery storage solutions. Considering the enormous hydrocarbon potential of Bolivia, the leaders expressed their interest to explore investments in exploration and development of different areas of hydrocarbon interest. They agreed to explore the export of Liquefied Natural Gas (LNG) from Bolivia to India and also the feasibility of laying a gas pipeline and setting up of an LNG plant on mutually agreed terms. The two leaders agreed to collaborate in the pharmaceuticals, including hospital equipment with a view to establishing such industries in Bolivia through public-public or public-private ventures. The collaboration could include areas of mutual interest such as oncological immunotherapeutic antiretrovirals and vaccines as also diagnostic equipment. Cooperation in the field of health would also include the exchange of best practices between two countries including cooperation in traditional medicine. The two leaders welcomed ongoing negotiations to conclude a cooperative MoU in the field of Traditional Systems of Medicine and Homeopathy. The two leaders expressed their willingness to develop projects for sharing of experiences in space technology applications including use of remote satellite data in agriculture, forest protection and management, water resources and other related topics. 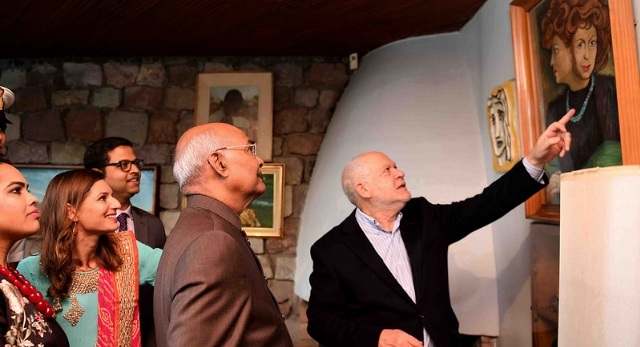 They also welcomed ongoing negotiations on a Memorandum of Understanding between the Indian Space Research Organisation (ISRO) and the Bolivian Space Agency (ABE). The two leaders agreed to strengthen cooperation in the area of Information Technology and Information Technology Enabled Services sector with a view to promote business to business cooperation and meeting the growing needs of present knowledge economy. The Indian side agreed to collaborate with Bolivia in its efforts in the areas of capacity building in IT sector and project execution particularly in regard to Digital Government, smart infrastructure, e-Health, e-Education and use of emerging technologies. The two sides welcomed the signing of an MoU to set up India-Bolivia Center of Excellence in Information and Communication Technology (CENETIC) in Cochabamba. The leaders agreed to explore cooperation for the construction project of the Bioceanic Integration Railway Corridor that links the Atlantic and Pacific oceans. They also agreed to promote and strengthen Economic and Technical Cooperation (ITEC) both bilaterally and within the framework of the National Development Plans and the 2030 Agenda for Sustainable Development. Bolivia welcomed the offer by India of $100 mn Line of Credit for financing development projects and doubling of the ITEC slots offered by India to Bolivian nationals. Following the culmination of the detailed discussions, the two leaders expressed their satisfaction with the outcome of their talks and the emerging clear road map to deepen and widen bilateral cooperation for the benefit of their people. 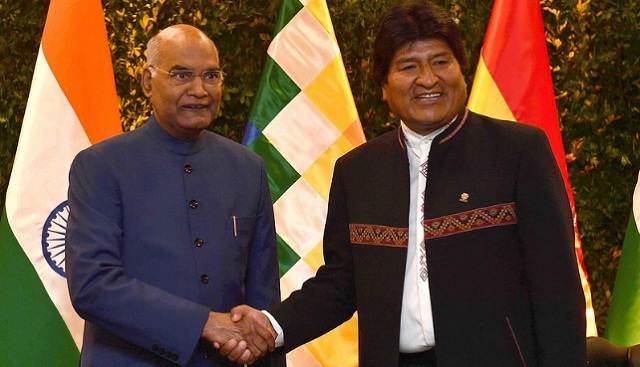 President Kovind then invited President Morales to visit India at a mutually convenient time.